It’s the time of year that I talk about vegetables a lot. I plant them, I talk to them, I weed them, I worry about them. And hopefully, eventually – I eat them! I have a whole group of new Facebook friends that I’ve never met, and we all talk about our vegetables. They mostly live a couple of hours from me in Spain, and we talk about things like: where to buy seeds and seedlings, where to buy natural fertiliser and pesticides, when and where to plant. It’s a nice group of people. 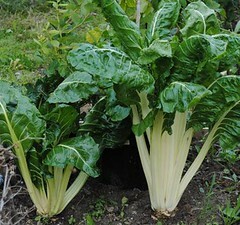 Oddly enough, this morning we were discussing acelga, which is the Spanish word for Swiss Chard. A lady in her group had lost her young acelga plants to her chickens, who marauded around her veggie garden after escaping from the hen house. (it brought to mind the year we lost all our sweetcorn to a herd of wild boar that tore down our fence). That sort of thing is very upsetting to the vegetable grower. This is acelga. Everyone grows it here, and it’s vitally important that you do, too. Unfortunately, said I, we really don’t like acelga. We both had a good laugh at that. Our landlord and good friend Pedro is no longer with us, but the joke and memory remain, and I still laugh every time anyone talks about acelga! Categories: Gardening | Tags: Chard, Garden, Kitchen garden, Vegetable, Yunquera | Permalink. Yes, my acelga looked a bit like that in the photos before my chickens took a shine to it. Funny though, we have the most lovely orange yolks in the egss now. Dark greens must be very good for their eggs!! Hi Rebecca, thanks for posting! Yes, you must now have the healthiest chickens in Spain!